Tetyana Kovalenko founded Elite Stone in 2000, after studying law, geology and mineralogy at Rome University. She moved the company from Rome to Carrara in 2007, then to vast premises outside Verona in 2013, opening the ‘Atelier’ in February 2017 as a showcase for innovative decorating ideas using marble, onyx, semi-precious stone, and back lit panels. 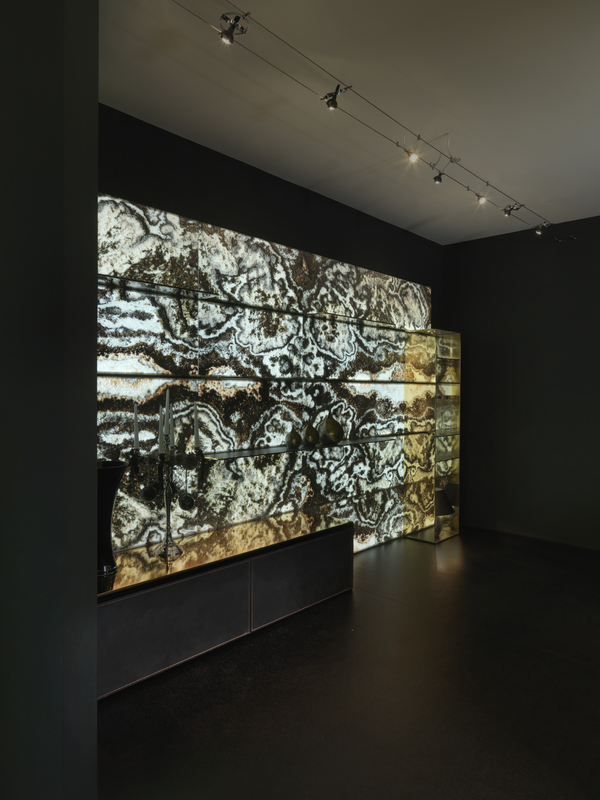 2000 square metres of stone slabs are stacked for easy selection in one building, and in ES Atelier, 300 metres of display, including room sets..
Elite Stone latest innovation is the E-Light system: thin sheets of marble and onyx layered on LED lights embedded in transparent glass. E-Light adds a theatrical effect to kitchens, cabinet doors, room dividers and front doors, an idea which has taken ten years of research to perfect. Size of the new showroom will be 200 square metres, on one floor, with different ‘aspirational’ settings, a ‘back to nature’ entrance, a living room with sliding doors, a back lit jaguar panel perhaps for a bathroom, and an innovative concept, the ‘one plate kitchen’ where appliances slide away, a space intended for those clients who might have two other kitchens, one for the chef, another for family. Pictures included of the ‘one plate kitchen’ with surfaces in backlit onyx, cupboards lined with marine plywood, a timber resistant to damp, and faced with hand stitched leather. Tetyana Kovalenko is the most dedicated and dynamic of businesswomen. She is determined to ensure that her team of designers, engineers and artisans have the expertise to fulfil her clients’ most extravagant dreams. Supplying the finest quality stone is only the first step.